Prominent poet Al Mahmud will be buried at his hometown in Brahmanbaria on Sunday, said family sources. Earlier, people from all walks of life thronged the Bangla Academy premises Saturday noon to pay their last tributes to prominent poet Al Mahmud. His first Namaj-e-janaza was held at Bangla Academy premises and then the body was kept at Nazrul Mancha of the Bangla Academy for sometime from 11:45 am so that people can pay their last tributes. Later, the second namaj-e-janaza of the poet was held at Baitul Mukarram National Mosque in the capital after Zohr prayers. 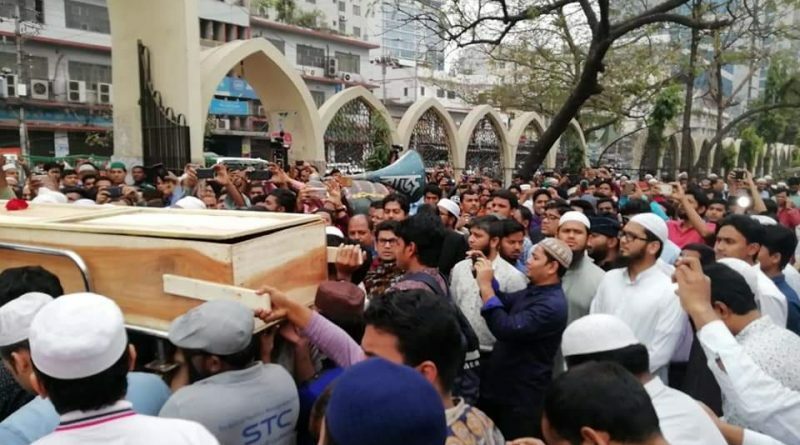 After the second namaj-e-janaza, his body will be taken to his residence at Moghbazar in the city and then it will be taken to Brahmanbaria where he will be laid to eternal rest. The poet breathed his last at 11:05 pm on Friday at the Intensive Care Unit (ICU) of IbnSina Hospital in the city’s Dhanmondi area. Mahmud started his career as a journalist and obtained widespread recognition after LokLokantor was published in 1963. Al Mahmud was honoured with EkusheyPadak, Bangla Academy Award, and KabiJasimUddin Award in recognition of his contribution to bengali literature.